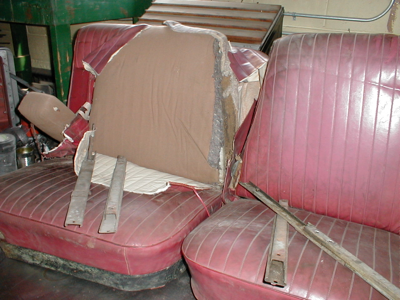 Skip McCabe (McCabe Restorations) and Werner, the upholstery guy were at the body shop to discuss the restoration. Werner is an older German gentleman, who worked on 300 SL’s in his youth. We pulled out a lot of the older pieces of the car, trying to uncover what was original, and how it was done. The interior of the car is one of the most critical areas, full of details. It is easy to mess up and hard to get right. Over the years, a lot of information has been gathered on later B20’s, s. 4 to s. 6, but very little on the earlier cars. The s. 1 and 2 B20’s are quite rare in the US (and not so common in Europe). They are more simply built, and have (in their details) some things just simply well done with nice hand crafting. They were not so refined as the later cars. Part of the goal here is to maintain that feeling. So first figure out how the sides of the seats were done, whether in cloth or vinyl, and whether there was vinyl was on the door “boards” or not. 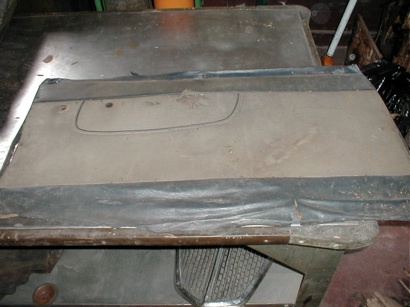 Luckily there are also some original pieces from a s. 1 parts car that show us what it was. But there is some variation from car to car – some say that there was little vinyl in the early cars, but there are early cars with vinyl on the rear side panels, behind the seats. Its pretty clear that there is a family of answers, but there was variation in that family as well. The next steps were to find the interior fabric and a source for the thin Italian vinyl that was used. Nothing too difficult!